Abstract. 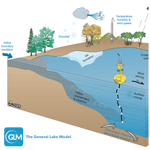 The General Lake Model (GLM) is a one-dimensional open-source code designed to simulate the hydrodynamics of lakes, reservoirs, and wetlands. 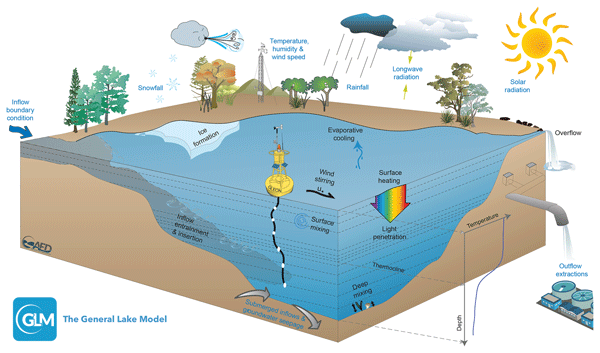 GLM was developed to support the science needs of the Global Lake Ecological Observatory Network (GLEON), a network of researchers using sensors to understand lake functioning and address questions about how lakes around the world respond to climate and land use change. The scale and diversity of lake types, locations, and sizes, and the expanding observational datasets created the need for a robust community model of lake dynamics with sufficient flexibility to accommodate a range of scientific and management questions relevant to the GLEON community. This paper summarizes the scientific basis and numerical implementation of the model algorithms, including details of sub-models that simulate surface heat exchange and ice cover dynamics, vertical mixing, and inflow–outflow dynamics. We demonstrate the suitability of the model for different lake types that vary substantially in their morphology, hydrology, and climatic conditions. GLM supports a dynamic coupling with biogeochemical and ecological modelling libraries for integrated simulations of water quality and ecosystem health, and options for integration with other environmental models are outlined. Finally, we discuss utilities for the analysis of model outputs and uncertainty assessments, model operation within a distributed cloud-computing environment, and as a tool to support the learning of network participants. How to cite: Hipsey, M. R., Bruce, L. C., Boon, C., Busch, B., Carey, C. C., Hamilton, D. P., Hanson, P. C., Read, J. S., de Sousa, E., Weber, M., and Winslow, L. A.: A General Lake Model (GLM 3.0) for linking with high-frequency sensor data from the Global Lake Ecological Observatory Network (GLEON), Geosci. Model Dev., 12, 473-523, https://doi.org/10.5194/gmd-12-473-2019, 2019.